Ponies and Donkey in a Forest Clearing by John Constable (1776-1837), oil on canvas, 24cm x 36cm. 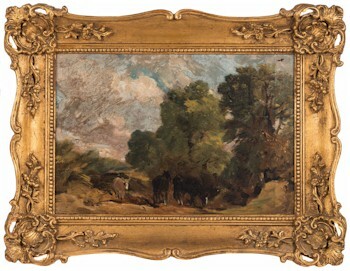 Bearnes Hampton & Littlewood is delighted to be offering an oil sketch by John Constable RA (1776-1837) entitled forest clearing with ponies and donkey in the Picture Auction on 6th October 2015 as part of the Autumn 2015 Fine Sale. This is a rare discovery of an important painting with impeccable provenance and specialist authentication that will be available well in advance of the sale. The pre-sale estimate for the painting is £40,000-£60,000. The sketch Ponies and Donkey in a woodland clearing is catalogued by Graham Reynolds as "Landscape with horses" in the Yale catalogue raisonne with a date of 1810. The date, 8th October 1810, was recorded on an old label (now believed lost) by Lionel Bicknell Constable (Constable's son) who presumably copied this from an original inscription by John Constable on the back of the sketch, but which was later covered some years later, possibly when conserved by William Down Ltd in 1965 with a lining. Reynolds notes that Constable was in Suffolk on 8th October 1810. Reynolds also informs us (on page 128 of the same book) that this is one of three dated, plein-air landscapes made in Suffolk that year (the other two are 10.4 and 10.5, dated 27th September 1810 and 30th September 1810 respectively). This sketch is close in handling to the other two sketches painted that year. We suspect this sketch was painted by Constable on one of the lanes in and around East Bergholt. However, it does have certain compositional similarities with two other oil sketches Constable made circa 1810, in the nearby village of Stoke-by-Nayland (See Reynolds 11.44 and 11.45). So it is just possible this subject also depicts Stoke-by-Nayland though, if so, perhaps odd that Constable should omit the church with its tall tower on the left-hand side.